MOVABLE PARTITIONS: OPTIMAL FLEXIBILITY FOR MUSEUMS AND GALLERIES. 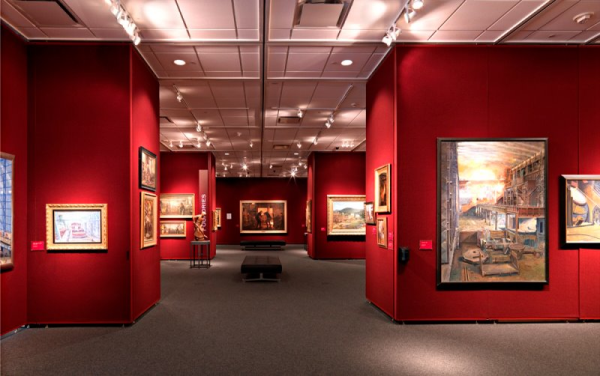 The use of movable partitions within museums and art galleries can create small groupings and arrange artworks thematically creating optimal flexibility. Hufcor® movable wall panels offer museums and galleries flexibility to arrange their spaces that help to “create dialogs” with their customers. Movable partition tracking systems can be arranged in overhead grids that allow panels to be reconfigured into nearly an endless number of configurations. As this photo of the Colorado Sports Hall of Fame demonstrates, more than 650 feet of track allow the panels to be set up into many different configurations. 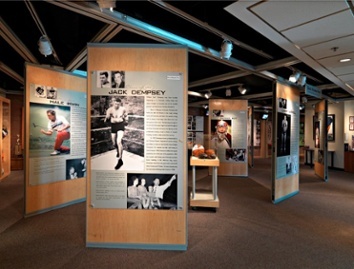 Museum managers can reconfigure the rooms to feature the season’s current sport and continually change the room layouts, creating a fresh floor layout, even if the content hasn’t changed. Museum designers can reconfigure the movable panels to set up traffic flow patterns that vary from exhibit to exhibit. By using operable partition panels with MDF, fiberboard or other sustainable face substrates, a gallery can confidently mount displays over and over again. Another benefit of using Hufcor movable wall panels is the ability to string multiple panels to create large, flat, interconnected walls to hang large displays or to create long corridors and display areas. The Eckhart G. Grohmann Collection Man at Work Museum at Milwaukee School Of Engineering incorporates this concept into three floors of museum space housing the largest collection of artwork dedicated to work in the world. Want to learn more? View our products here.